In this work, we discuss the modeling of edge-emitting high-power broad-area semiconductor lasers. We demonstrate an efficient iterative coupling of a slow heat transport (HT) model defined on multiple vertical–lateral laser cross-sections with a fast dynamic electro-optical (EO) model determined on the longitudinal–lateral domain that is a projection of the device to the active region of the laser. Whereas the HT-solver calculates temperature and thermally-induced refractive index changes, the EO-solver exploits these distributions and provides time-averaged field intensities, quasi-Fermi potentials, and carrier densities. All these time-averaged distributions are used repetitively by the HT-solver for the generation of the heat sources entering the HT problem solved in the next iteration step. 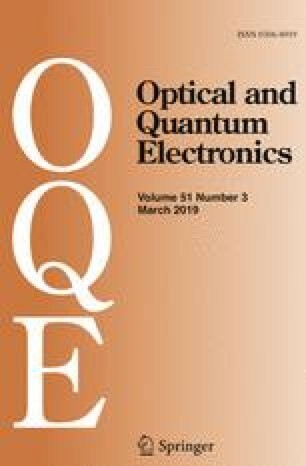 This article is part of the Topical Collection on Numerical Simulation of Optoelectronic Devices, NUSOD’ 18. Guest edited by Paolo Bardella, Weida Hu, Slawomir Sujecki, Stefan Schulz, Silvano Donati, Angela Traenhardt. This work is supported by the German Federal Ministry of Education and Research contract 13N14005 as part of the EffiLAS/HotLas project and by the EUROSTARS Project E!10524 HIP-Lasers.